What were the main educational ideas of Maria Montessori and why did she develop them? Maria Montessori was a unique individual. Today the news media would describe her as a person who thinks outside of the box — a pioneer in enabling children to learn through meaningful experiences. The culture of her time, the late 1800’s in Italy, expected her to become a teacher or a nun — she earned a medical degree. At an international congress on women’s rights she represented Italy and advocated equal pay for equal work. As a new medical doctor she worked initially with young subjects in a psychiatric clinic and then with children classified as “mentally defective” students. Her students passed the public examinations. At the turn of the century Maria Montessori, a thirty-year-old medical doctor, mothered her only child — outside of marriage. Today some 7000 schools worldwide call themselves Montessori schools. Maria Montessori was born August 31, 1870, in Chiaravalle, Ancona, Italy to Renilde Stoppani and Alessandro Montessori— an only child filled with strong determination and love. Maria Montessori grew up in a time when girls in Italy had only two career paths —to be either a teacher or a nun. Schools were regimented, rigid and repressive. So Maria Montessori did not want the career of a teacher. Mathematics and science fascinated her, and after her traditional primary schooling Maria Montessori went on to a technical school to study engineering. Her mother was very supportive of her goals while her father, more traditional and conservative, wanted his daughter to pursue teaching. Technical schools were usually available only to boys. Maria and another girl were able to attend but were not allowed to go outside with the boys at recess. Much to her father’s dismay Maria Montessori decided to attend medical school, which was not open to women. Maria Montessori persisted and enrolled at the University of Rome. She faced many challenges as the only female medical student in the school. She was not permitted to work with cadavers in mixed company. So she had to study the cadavers in the evenings by herself. Despite the many obstacles Maria Montessori excelled as a student and during her required medical student lecture received a standing ovation. She had charmed and impressed her audience, which included her father who reluctantly attended after encouragement by a family friend. This experience gave Alessandro a new insight into his daughter and turned his original displeasure into great pride. In July 1896 Maria Montessori became the first woman in Italy to receive a Doctorate of Medicine. Two months later, in September 1896, Maria Montessori was invited to serve as a delegate for Italy at the International Congress for Women’s Rights in Berlin, Germany. Again she enchanted the audience with her charisma and the conference adopted her proposal of equal pay for equal work. Many newspapers wrote about Maria Montessori and described her as the beautiful scholar. Following the conference Maria Montessori returned to Italy and began her appointment as assistant doctor at the Psychiatric Clinic at the University of Rome. She was responsible for visiting insane asylums in Rome to select young subjects for the clinic. The children fascinated her. But she observed that their environments were barren with nothing to stimulate the development of their thinking; the children’s brains were starving. Maria Montessori researched special education and came upon the works of Jean Itard (1775-1838), who was famous for his work with the “Wild Boy of Aveyron” and the works of Itard’s student Edouard Séguin (1812-1880), who created physical and sensory activities to develop mental processes. Itard worked with the “wild boy”, a youth who was found living alone in the forest for about 10 years, and developed a methodical approach to teach the “wild boy”. Itard based his work on observations and experiments that led him to assume that normal human growth has developmental phases. Maria Montessori was fascinated by Itard’s work and scientific approach to learning. In 1898 Maria Montessori and Giuseppe Montesano were named co-directors of the Orthophrenic (mentally retarded) School of Rome. Maria Montessori methodically studied her disabled students (labeled ”“idiots” or “mentally defective”). Through her observations, she was able to understand what methods succeeded in helping her students develop skills of independence and academics. Maria Montessori created a very different environment. Their new environment and experiences enabled the disabled students to take care of themselves and to learn sufficient skills to pass a public examination for “normal” children. Her great success with these disabled children earned her national recognition. The Italian minister of public education invited Maria Montessori to present lectures to teachers on how to educate disabled students. Maria Montessori had become a strong proponent for educating children with disabilities instead of treating them as medical specimens. She helped begin to reform the way disabled children were treated. During her time at the Orthophrenic School, Maria and Giuseppe had a romantic affair, which produced a son, Mario (sometime between 1898 and 1901). Maria and Giuseppe did not marry. Because having a child out of wedlock during this era would have been scandalous to Maria Montessori’s career and family, Mario was sent to a wet nurse in the country. Maria Montessori would visit Mario when she could. Shortly thereafter, the romantic relationship dissolved after Giuseppe decided to marry another woman in 1901. Maria Montessori then left the Orthophrenic School and returned to the university to study psychology and philosophy. She immersed herself in her studies and translated the works of Jean Itard and Edouard Séguin into Italian. Maria Montessori also lectured at the teacher training college and was a professor in anthropology at the university during this time. In 1907 Maria Montessori gave up all her commitments to focus on educating the “normal” child.She was asked to establish a center in the slums of the San Lorenzo quarter of Rome to care for 50 unruly preschool aged children who were left unattended while their parents worked. Here the first "Casa dei Bambini “ or “Children's House” was born. Maria Montessori had child-sized furnishings made for the center and set up the classroom like a large, child-sized family room. She set up activities similar to what she used with her disabled students. Maria Montessori observed that these “normal” students, unlike the disabled students, did not need to be directed to use the materials. They had an inner urge to work with the activities she introduced. She also observed that the children loved to learn how to take care of the environment and learn how to care for themselves. The children loved and took great pride in the independence and self-help skills they acquired. Maria Montessori observed deep concentration in the child at work and noted how a child could repeat an activity 42 times till the child was satisfied; she observed this to be the child’s need for self-construction. She originally locked up the didactic materials in a cupboard at the end of each day, but when she arrived late one day she discovered that the children had on their own taken the materials out of the cupboard, which had been accidentally unlocked. They wanted to work and took good care of the materials. This experience led Maria Montessori to believe that the children can be given the freedom to work independently with the materials once she had shown them how to use the materials. She got rid of the cupboard and replaced it with low open shelves from which the children can select the materials independently. She engaged the children in real life activities like hand washing, washing a table, or polishing shoes. Maria Montessori’s principle of focusing on the whole child enabled the children to develop independence and self-discipline that led to freedom and self-confidence. She noted that freedom and self-discipline were both interdependent; one cannot be achieved without the other. In her Casa dei Bambini, Maria Montessori helped transform the unruly group of young children into happy, calm, self-disciplined, well-behaved children. This transformation gained worldwide recognition, and many traveled to see Maria Montessori’s classroom in San Lorenzo. Maria Montessori developed a science of education based on the observation of children’s needs; she looked to the child to teach her. She analyzed her observations to uncover how children learn. She published many books on how to understand and educate the child. Maria Montessori observed that children under six have an extraordinary power of mind in which they all have a once-in-a-lifetime ability to absorb knowledge from their environment; their minds are like sponges and do not analyze what they soak up (i.e., it is much easier for a child to learn a foreign language than it is for an adult). Maria Montessori called this "the absorbent mind". In more of her observations, Maria Montessori discovered that children have sensitive phases of development in which a child reveals an especially strong all encompassing interest towards a piece of knowledge or skill.For a child under age six, Maria Montessori observed there to be sensitive phases for acquiring language, a sense of order, an interest in tiny things, the exploration of the senses, tactile information, writing, words, numbers and counting, manners, and precise movement. The key is for the educator to observe and identify a sensitive phase and then take advantage of this concentrated interest by the child to promote periods of intense learning that comes easily and with little effort for the child. In addition, Maria Montessori learned from her observations that children learn best by being given the opportunity to discover and learn by manipulating objects. She advocated then for what is now called a hands-on approach to learning. She carefully designed materials (through trial and error) to help children explore and classify, using their senses. Furthermore, she observed the young child’s need for order and the innate need to know where and how things belong; her classroom design included child-sized materials and furniture arranged for optimal movement without congestion. She highlighted the child’s need for movement and repetition. Children were encouraged to move and learn and not sit at desks all day. Children learn in many different ways. A child can learn directly from a lesson given by the teacher, from a small group lesson, directly from another child, or from watching another child use the materials. All these observations of the child’s needs have been incorporated into the didactic materials and the methods of working with the materials; Maria Montessori combined theory into practice. She focused on how to teach children to teach themselves in which the prepared environment is central to children’s learning. Maria Montessori saw the teacher as a guide to the environment. She was a strong advocate for mixed aged groups of a three year span within a non-competitive environment that would allow each child to develop at his or her own pace. In March 1948, Maria Montessori summarized her educational approach in a statement to the press. Maria Montessori returned again to the U.S. in 1915 and set up a classroom enclosed by glass at San Francisco’s Panama-Pacific International Exposition. Thousands of people from all over the world came and observed her teaching method during the four months of the exhibit. When awards were given, the Montessori class won the only two gold medals for education. “My life has been spent in the research of truth. Through the study of children I have scrutinized human nature at its origin both in the East and the West and although it is forty years now since I began my work, childhood still seems to me an inexhaustible source of revelations and – let me say – of hope. Childhood constructs with what it finds. If the material is poor, the construction is also poor. As far as civilization is concerned the child is at the level of the food-gatherers. In order to build himself, he has to take by chance, whatever he finds in the environment. The child is the forgotten citizen, and yet, if statesmen and educationists once came to realise the terrific force that is in childhood for good or for evil, I feel they would give it priority above everything else. All problems of humanity depend on man himself; if man is disregarded in his construction, the problems will never be solved. No child is a Bolshevist or a Fascist or a Democrat; they all become what circumstances or the environment make them. Maria Montessori’s work continues. She provided a foundation for theorists like Jean Piaget and Lev Vygotsky. Jean Piaget (1896-1980) was an epistemologist from Switzerland who is more well known as a psychologist who derived the cognitive development theory. He classified children’s cognitive development into stages and believed there is a strong correlation between cognitive and physical development. Lev Vygotsky (1896-1934) was born and educated in Russia. He believed that interaction played a key role in cognitive development and that cognitive development was influenced not only by physical development but social surrounding and interactions. Vygotsky strongly believed that it was important for the teacher to know when a child is in his “zone of proximal development”. Maria Montessori’s influence is also seen today in many early childhood education programs in the USA. Today there are over 7,000 Montessori schools worldwide. You can find schools that serve children from infancy all the way through adolescence. A Montessori school today has an orderly and beautiful child-sized environment in which the teacher serves as the guide to the environment. The children, with the guidance of their teacher and a large block of time to work without interruption (ideally three hours), learn by using the manipulative didactic materials to make discoveries, develop concentration and self-discipline and a love of learning. The children have the opportunity to learn via a group lesson, an individual lesson from the teacher or another child or merely from observing another child working with the material. The children responsibly tend to keeping their classroom and school clean and orderly. The Montessori teacher’s role is to be constantly observing and reflecting on the children and her classroom and to use these observations to guide her in planning the curriculum and environment. August 31 - Maria Montessori is born in Chiaravalle, Ancona, Italy. Maria goes to a boys’ secondary school in order to study mathematics. Maria graduates from high school and enrolls in a technical school to study engineering. Maria begins her studies in medicine. July 10-Maria receives her Doctorate of Medicine degree; she is the first woman to graduate from the University of Rome’s School of Medicine. September – Maria serves as a delegate for Italy at the International Congress for Women’s Rights in Berlin, Germany; her proposal for equal pay for equal work for women is adopted. Maria is appointed assistant doctor at the Psychiatric Clinic in the University of Rome. Maria becomes a member of the National League for the Education of Retarded Children. Maria is appointed co-director with Dr. Giuseppe Montesano of the State Orthophrenic School (for mentally retarded children) in Rome. Sometime between 1898 and 1900 Maria gives birth to her out of wedlock son Mario. Maria is a lecturer at the women’s teacher-training college. Maria attends a feminist congress in London and speaks out against the exploitation of child labor. Maria leaves the Orthophrenic School and returns to the University to study psychology and philosophy. The University of Rome appoints Maria as a lecturer in science and medicine, and she chairs the Department of Anthropology. January 6 - Maria opens the first Casa dei Bambini in San Lorenzo, Italy. Summer – In Citta di Castello, the first Montessori training course is held. Maria’s book, The Montessori Method, is published in Italian. Anne George, an American, goes to Rome to take Maria’s training course. The first American Montessori school opens in Tarrytown, New York; this is the result of great interest in a long article about Montessori that was published in the American magazine, McClure. The Swiss and Italian public schools decide to use the Montessori Method as their standard system. The Montessori American Committee is formed by Anne George, Sam McClure and Mr. & Mrs. Bell; they organize the first international training course in Rome. Maria’s book The Montessori Method is translated into English. Renilde Stoppani Montessori dies in December. Maria visits the U.S. for the first time due to Sam McClure’s persuasion; there are already over one hundred Montessori schools in operation. Maria gives a lecture at New York’s Carnegie Hall on Dec. 6.The Montessori American Committee becomes the Montessori Educational Association under the direction of Mabel Bell (Alexander Graham Bell’s wife) as president. Spain’s first Montessori school opens. The Advanced Montessori Method (The Pedagogical Anthropology) is published. Dr. Montessori’s Own Handbook is published. William Heard Kilpatrick, a leading American educational theorist at Columbia University, criticizes Montessori’s philosophy as being outdated. Maria sets up a classroom at San Francisco’s Panama-Pacific International Exposition where thousands of people were able to observe her teaching method during the four months of the exhibit; the Montessori class won the only two gold medals for education. May – Maria conducted her first American training course in Los Angeles. November - Maria’s father dies while she was in the U.S., and she immediately returns home. The Montessori Educational Association (MEA) dissolves due to lack of support from Maria, and the Montessori movement in the U.S. dies down for some time. Maria gives her first training course in Barcelona, Spain, at the Seminari Laboratori de Pedagogia; students from Spain, Portugal, U.S. and Great Britain attended. Maria’s son Mario weds an American, Helen Christie. Maria lectures at a training course in England; her lectures now include methods and materials for 6-11 year olds. The Spanish government stops supporting the Montessori training institute due to Maria’s refusal to comply with the government’s politics. Maria is appointed a government inspector of schools in Italy. Maria meets with Mussolini, and he agrees that the Italian government should again support Montessori schools. The Montessori Society of Argentina is founded after Maria’s lectures in Buenos Aires, La Plata and Cordoba. The Association Montessori Internationale (AMI) is founded in Berlin, Germany. The Child in the Church is published. Mussolini closes all the Montessori schools because the teachers would not pledge loyalty to Fascism. Maria leaves Italy and returns to Spain. Peace and Education and The Mass Explained to Children are published. The AMI relocates to Amsterdam and continues to be headquartered there. The Spanish Civil War begins and Maria leaves Spain for England. Maria is invited to reside in Holland by one of her students, Ada Pierson. The Secret of Childhoodand The Child in the Family are published. Maria and Mario fly to India to escape World War II (Mahatma Gandhi had visited the Casa dei Bambini in Rome). Erdkinder and the Function of the University (The Reform of Education During and After Adolescence) is published. June - Mario is sent to a prison camp because he is Italian (enemy alien) and India is under British rule. Maria is, however, given permission to travel around India. 31 August – Mario is returned to his mother as a 70th birthday gift from the Indians. A palm leaf roof hut is built as Maria’s training center in Madras. August – Maria and Mario return to Holland and then travel to England. Education for a New World is published. Maria and Mario start a training center in London, England, with Margaret Homfray and Phoebe Child as directresses. Maria and Mario traveled for two years all around India (Madras, Bombay, Gwailor) and to Ceylon and Pakistan. The Discovery of the Child is published. Maria addressed the Eighth International Montessori Congress with hopes that those in attendance (Catholics, Quakers, Hindus, Muslims and Buddhists) could all work together to bring peace throughout the world. The Absorbent Mind is published. Maria Montessori is nominated for the Nobel Peace Prize. December – France bestows Maria with the Cross of the Legion of Honor (France’s highest honor). To Educate the Human Potential, What You Should Know About Your Child and The Formation of Man are published. Maria addresses the United Nations Educational, Scientific and Cultural Organization and receives standing ovations after each speech. Maria Montessori is nominated again for the Nobel Peace Prize. Maria Montessori is nominated a third time for the Nobel Peace Prize. Maria Montessori addresses a United Nations education conference in Florence, Italy. May 6 - Maria Montessori dies at the age of 81 in Noordwijk aan Zee, Holland. The American Montessori Society (AMS) is formed. The US Patent and Trademark Trial and Appeal Board denied exclusive trademark and registration of the term “Montessori” to any one particular organization. 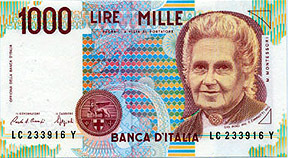 The Italian government honors Dr. Maria Montessori by putting her on the 1000 Lire paper currency note. Today there are over 7,000 Montessori schools all around the world. The North American Montessori Teacher’s Association (NAMTA) is an organization that serves as a channel of information for anyone interested in Montessori education (parents, teachers, administrators) with the goal of improving Montessori education. The web site is very informative and filled with resources. The Association Montessori Internationale (AMI) is dedicated to maintaining the integrity of Maria Montessori’s work. It is filled with resources and information. You can also view a collection of photos of Maria Montessori (A.M.I. Pictorial Tribute). The American Montessori Society (AMS) was formed in 1960 to be the base for the Montessori movement in the USA. The Montessori Teachers Collective (MTC) is dedicated to “promote the Health and Good Humor of Montessorians Everywhere”. This site has many links and information on Montessori education. It also has a link for companies that sell Montessori materials and a link for the various Montessori associations/societies worldwide. You can also check The Montessori Method. Montessori Online is a resource center provided by the Montessori Foundation, which promotes the advancement of Montessori education in the USA and worldwide. This link shows the variety of Montessori training that is available around the world, and the International Montessori Index provides an even more complete list of links and information about Montessori education. Maria Montessori is included in women’s contributions to society. UNESCO publishes a quarterly review of comparative education called Prospects and has an article on Montessori (*.pdf) in its 1994, vol. XXIV, no. 1/2 edition. Two other organizations are American Montesorri Consulting and the International Montesorri Society. The following books are by Maria Montessori (I have listed the most recent publishing date.) You need to keep in mind when reading these books that they were originally written in Italian and then translated into many other languages; therefore, the book's translation may not reflect the style of the original Italian. I would recommend reading one of Paula Polk Lillard’s books first to get an easier introduction to the Montessori philosophy before diving into one of Maria Montessori’s own works. The Absorbent Mind by Maria Montessori (September 1995). This book is not an easy read for someone unfamiliar with the Montessori philosophy in that it is quite dense with theories on the development of the young child from zero to three years. For an educator, the book is fascinating especially if you consider it was originally written in 1949. The Montessori Method by Maria Montessori (August 2002). Maria Montessori explains her scientific pedagogy for the child from age three to seven in this book. It was originally written in 1909. Discovery of the Child by Maria Montessori (December 1996). This is an easier read than The Absorbent Mind. It explains the nature of the child and how to engage the child in learning. It was originally written in 1948. Dr. Montessori's Own Handbook by Maria Montessori (November 1988). This book gives a more detailed description on how to use Montessori’s didactic materials. It was originally written in 1914. The Secret of Childhood by Maria Montessori (December 1992). Maria Montessori gives the child’s perspective in learning. It was originally written in 1936. Education for a New World by Maria Montessori (1989). This book illustrates how the teacher’s best teacher is the child. Maria Montessori: Her Life and Workby E. M. Standing (August 1998). This is a nice biography of Maria Montessori. It was first published in 1957 and Maria Montessori had previewed and approved of the book before her death. Montessori Today: A Comprehensive Approach to Education from Birth to Adulthood by Paula P. Lillard (January 1996). This is a description of the Montessori philosophy for each developmental stage with more information on the elementary aged child and the theories on adulthood. Montessori: A Modern Approachby Paula P. Lillard (November 1988). This is an easy to read description of the Montessori philosophy and information on contemporary American Montessori schools through the 1970s. A Parents' Guide to the Montessori Classroom by Aline D. Wolf(March 1995). This is a simple guide explaining the materials a child in a Montessori classroom would be using; it is a helpful guide to parents in understanding what activities their child talks about working with at school. Theories of Childhood: An Introduction to Dewey, Montessori, Erickson, Piaget & Vygotsky by Carol Garhart Mooney (November 2000). Peaceful Children, Peaceful World: The Challenge of Maria Montessori by Aline D. Wolf (September 1989). Wolf has edited passages from Maria Montessori’s book Peace and Education (1932) in order to provide insights into Montessori’s view of reaching peace through education. It is amazing how relevant Montessori’s writings on peace are today. This page is copyright © 2003, C.T. Evans and M. Dasbach.